music stores filled with passion. >33% YoY growth in online sales. 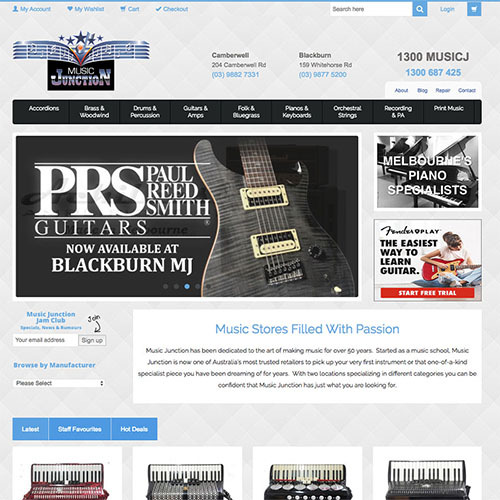 Being Melbourne’s oldest music store, Music Junction needed to update its website and marketing to grow the stores reach online. While they did have an online store, it was difficult to manage, did not index very well on search engines and was plagued by out of date stock. To combat this, Music Junction was spending a large sum of money on Google Adwords each month. A sum of money that was unsustainable, so something needed to change quickly. The solution was a dual strategy. The first was a complete re-build of new eCommerce platform that would allow the Music Junction team to easily manage their stock, content, and orders. The second part was to take control of the Google Adwords account to see where efficiencies could be found so that the budget could be halved. While the paid traffic budget needed to halve it was also crucial that online sales grew to expand the reach and success of the Music Junction brand. Thanks to Marmeg we’ve seen a solid increase in online sales over the last couple of years that is more than 30% YoY. The ability to integrate directly with socials and blogs allows us to have complete control and continue to improve.